Free 5GB iCloud storage space for one Apple ID is welcome but far from enough especially when you have two or more Apple devices and 8GB or 16GB iPhone. Alas, iCloud "Not Enough Storage" message pops up! If iCloud storage upgrade is not right for your needs, follow the guide below to learn how to free up space on iCloud easily and efficiently without forking out any cash and fix iCloud backup not working issue caused by full storage. 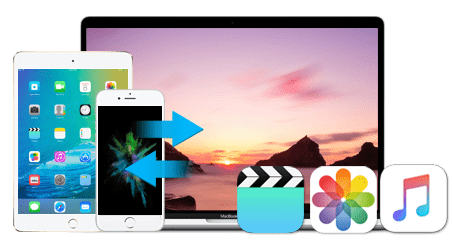 No storage and time limits, no troublesome iCloud storage space management, MacX MediaTrans helps speedily backup iPhone iPad iPod files to Mac/PC needless wifi connection, including videos, photos, movies, TV shows, books, ringtones, podcast etc. media files. Open Settings > iCloud > Storage on iPhone, iPad and iPod running iOS 9/10. Or head to Apple menu > System Preferences > iCloud > Manage on Mac computer. Or open iCloud, click Manage on Windows PC to check out how much free iCloud storage you have before or after you clean up iCloud storage space. Go to Settings > iCloud > Storage > Manage Storage and select the name of device' backup, and tap Delete Backup to make more space on iCloud. Open iCloud by clicking Apple menu > System Preferences, and click Manage, choose Backups, then select iOS device whose backups you want to delete and click Delete to manage iCloud storage space. Open iCloud on Windows, click Storage > Backups, choose iOS device and click Delete to get more storage on iCloud for free. It also works to fix photos not uploading to iCloud due to full iCloud storage. If you are a frequent mailer who use iCloud mail not Gmail, Hotmail, Yahoo mail, and your emails often come with large-sized attachments, you can delete emails from iClud email account to solve not enough iCloud storage embarrassment. Steps to mange iCloud storage space occupied by emails are as follows: Select messages on iCloud Mail and tap "Move to Trash" icon, choose Edit and tap Delete All icon and iCloud emails will be deleted to extend iCloud free space. You can delete a single or multiple messages in batch. You can remove emails on Mac/PC as well. Documents and data, including caches data, apps and a host of other stuffs, can eat up lots of free iCloud space. How to clear a space on iCloud by deleting documents and data you don't need anymore? It's simple: Open settings, click iCloud > Storage > Manage Storage, select app under the "Documents & Data" list, and then choose Edit and tap on Delete All. Learn how to free up space on iPhone if your iPhone storage also gets full. It's a big waste of iCloud free storage to backup files you don't need at all. 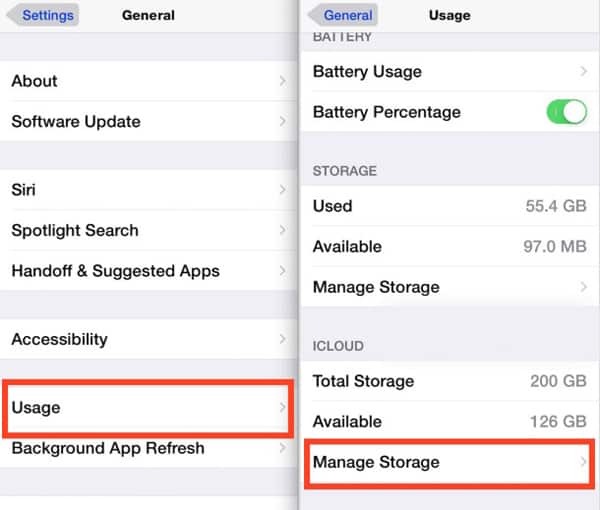 You can increase free iCloud space available by turning off unnecessary backups. Here's how to free up space on iCloud in this way: head to Settings > iCloud > Storage > Mange Storage and choose the iOS device. 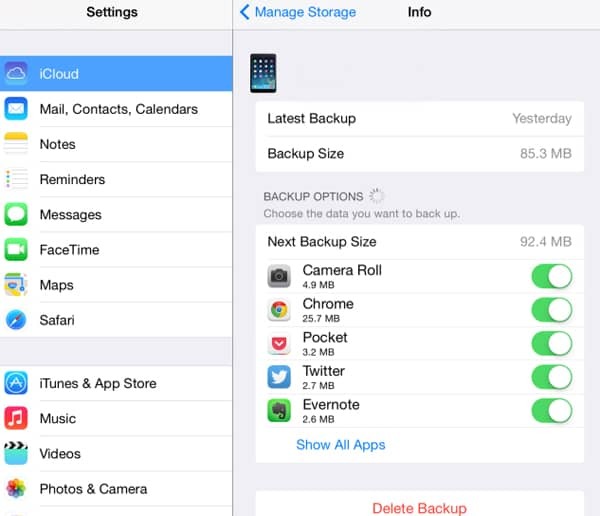 From the Backup Options, turn off unwanted backup options to reduce the size of iCloud backup. When you free up enough space on your iCloud, then you can begin to upload photos to iCloud. You don't need to delete backups and data to make space for iCloud by using other backup apps that can backup up iPhone without iCloud, including photos, videos, movies etc. so that you can use limited iCloud storage to backup other small files like contacts and messages. Some good iCloud alternatives include iTunes, Google Drive, Dropbox, OneDrive, and the most useful and feature-rich one, MacX MediaTrans. The all-around data backup program helps backup iPhone iPad iPod videos, music, movies, TV shows, photos, books, voice memos and more to Mac/ PC in batch with nearly no size limits and needless of wifi connection. In addition, the iCloud alternative gives many other options, for example, transferring files between iDevices and Mac/PC, managing music photo video etc. files, making ringtones, auto converting music video books file formats, to name a few. If you've tried the above ways to free up space on iCloud and still want to increase iCloud space, you can upgrade iCloud storage to 50GB, 200GB, 2TB and get more iCloud storage on iPhone, iPad, iPod. Go to settings > iCloud > Storage > Buy More Storage or Change Storage Plan, select a pan and click Buy, then enter Apple ID password. Apple charges monthly. MacX MediaTrans, all-in-one iCloud alternative for more than data backup, help backup iPhone iPad iPod data to Mac/PC with no storage limits and data management options. Problem of Photos Not Uploading to iCloud Fixed!